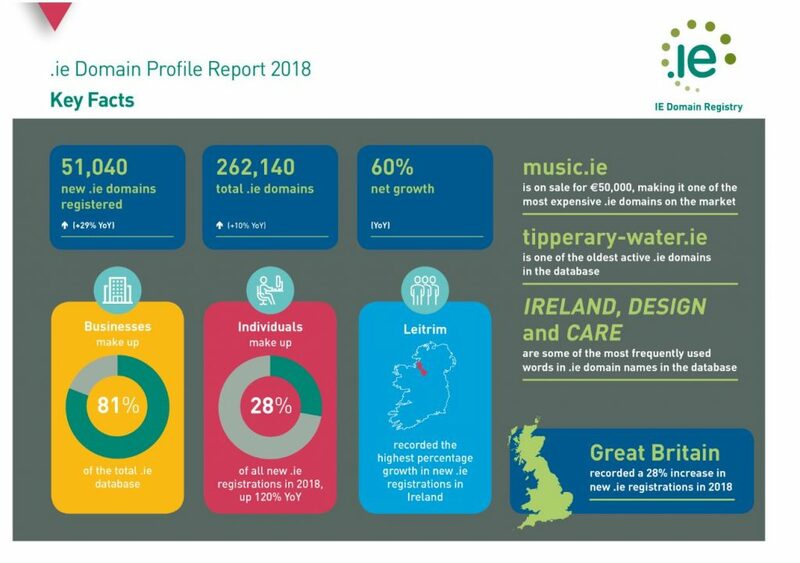 51,040 new .ie domains were registered in 2018, up +29% on 2017, according to our latest .ie Domain Profile Report. The total .ie domain database recorded 262,140 active domains at the end of 2018, up +10% on the previous year. In this edition of the .ie Domain Profile Report, we explore the numbers and types of .ie domains registered in 2018, where they were registered, as well as information about the wider .ie domain ecosystem. The large year-on-year growth demonstrates the success of the changes we made to the .ie domain registration process in March 2018. It is now easier and faster to register a .ie domain. Applicants only need to provide one document to prove identity and a connection to Ireland. Returning customers do not need to re-submit any documents and can avail of a new FastPass system. – 81% of all .ie domains are owned by businesses, indicating a national understanding of the value of digital business and marketing. – In many Border, Midlands and West region counties, new .ie domain registration growth was higher than in Dublin. 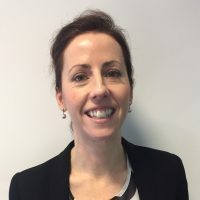 – The increase in domains registered by individuals suggests a positive impact of the relaxation of .ie registration rules to allow nicknames and geographical names, along with the rising popularity of .ie for personal branding purposes. – There was a +59% increase in the number of .ie domain names registered by international users. – Dublin registered the lion’s share of new .ie domains in 2018 (43%), followed by Cork and Galway. – The number of .ie websites with SSL security certificates increased by +37.9% quarter-on-quarter (Q3 vs Q2 2018)* after Google Chrome introduced a new feature that warns users about potentially unsafe sites. “2018 was a record-breaking year for .ie, and much of that success is owed to the registration rule change. We’ve made it easier and faster to register a .ie domain. 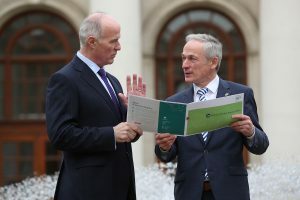 David Curtin, Chief Executive of IE Domain Registry pictured with Minister of Communications, Climate Action and Environment, Richard Bruton T.D. at the launch of the .ie Domain Profile Report 2018.